WhatsApp finally allows people to send and receive stickers from each other, something other messaging apps added years ago. This new development brings with it an exciting possibility — the ability to create your own WhatsApp stickers. There are multiple ways to create WhatsApp stickers, but the easiest ways are by downloading apps that let you create stickers quickly. We managed to create WhatsApp sticker packs in less than five minutes on iPhone and Android, so the process is really simple. Before you proceed, it’s important to note that the best way to create custom sticker packs is mentioned on the WhatsApp website. There are sample apps provided by WhatsApp where you can make some basic changes and submit them to the App Store or Google Play, making these your own sticker creating apps for WhatsApp. However, this is not a practical option for most people, so we went through all the steps via the easy method and have listed them below. Please note that these third-party sticker making apps work very well, but we don’t know much about their origin and whether these apps will misuse any permissions you grant. We’d think twice before granting third-party apps permissions to your entire photo gallery as that can be misused. If that’s fine by you, follow these steps to create your own stickers for WhatsApp. Follow these steps to make your own WhatsApp sticker packs on Android. Download the Sticker Maker app on Android. Tap Create a new stickerpack. Name the sticker pack and add an author name for the pack, in case you want to take credit for creating these stickers. You will see 30 tiles in the next screen. Tap any of these and then you can tap Take Photo, Open Gallery, or Select File to select pictures. The first option lets you take a picture, the second opens your photo gallery, and the third lets you select images from your file manager. The next step allows you to cut the picture into a shape. You can select one of Freehand (to draw a shape manually and crop the sticker), Cut square, or Cut circle. Once you are done cropping, tap Yes, Save Sticker. Once you have three stickers added, you can tap Add to WhatsApp. You will see a confirmation message on screen once it’s been added. Now open WhatsApp, tap the emoji icon > stickers icon at the bottom. Now you will see your new sticker pack as the last one in the list of sticker packs. To delete a sticker pack, tap the pack > three dots icon on the top-right > Delete. Follow these steps to make your own WhatsApp sticker packs on an iPhone. 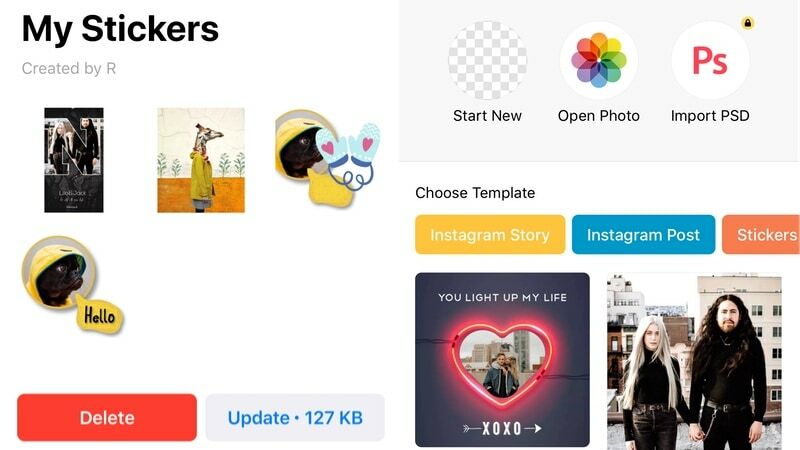 The app we’re going to use is a polished photo editing app that makes it really simple to create WhatsApp sticker packs for free. Download the Bazaart app on iPhone. Open the app and tap either Start New or Open Photo. Now you can use the app’s tools to create your sticker. You can easily cut it into shapes, add dialogue boxes, and much more via Bazaart’s on-screen tools. Once you are done, tap the Share icon and tap WhatsApp. The app will ask you to add your name in case you want to take credit for the sticker pack. Then, on the next screen tap Add to WhatsApp. This will add your sticker to WhatsApp. Tap the sticker icon which in the form where you type messages. Your stickers will show up here. Bazaart lets you easily update your sticker pack as well. Just repeat steps 2 to 4 above and you will see a new screen asking you whether you want to update or delete your sticker pack. Tap Update to add more stickers to your pack. Bazaart is a free app on iPhone with most of its features locked behind a monthly subscription fee. Creating WhatsApp stickers is completely free, but in case that changes in a future update, you can always use a different app such as Sticker Maker for WhatsApp to get the job done just as easily. How did you create a WhatsApp sticker pack? Let us know via the comments.